and the better intake characteristic of the Quasiturbine allows higher flight altitude. the shaft can be damaged and replaced without the Quasiturbine engine being affected). while making much less noise. while the cylinder is cooled by an air flow. 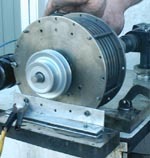 since both the stator and the rotor are cooled by an air flow and react simultaneously the same way. in the range of 70 to 100 HP is in part completed. Construction of an experimental prototype will be a priority... when combustion comes commercial. No temperature limit in the jet nozzle! Here a way simple to look at the turbine engines. Suppose a rectangular box of 12 in. by 12 in. of section by 5 feet length. but add a pressure of 100 psi to the exit section. You will then have a displacement of the box, but with which force? the 12po X 12po gives 144 square in. X 100 = 14,000 pounds! and you will be supersonic on takeoff! what is much more than a small Cessna! Conclusion, the pressures in the gas turbines are not considerable, although the speed of gases is. and strongly reverse the negative adiabatic cooling, providing the air motor can accept this kind of hot air ? This was the idea of Joule (also Brayton) when the designed their cycle of turboshaft jet engine ! and the air motor is to inject the fuel into that same air flow and burn it insitu. Turboshaft jet engine are noting else than large air heated motors carrying their own compressor ! which generate the abrupt interruption of engine (flame out) with important structural damage. although turning at a much lower speeds. rather that by a conventional power turbine. leaving all the reactor energy available to drive a still more powerful Fan. The Quasiturbine air intake could come from the compressor. as well as the compressed air. where the compressor would be driven by a Quasiturbine, leaving to the Jet all its propulsive energy. and would permit to substantially increase the speed and the efficiency. This airplane engine would operate in the same mode as the rocket engines! the Quasiturbine could be fueled in pneumatic mode in hydrogen peroxide. and at a much lower cost than conventional turbines. 5) Two Quasiturbines in series (in pneumatic mode). Power produced from pressured gases is proportional to (pressure) X (the flow). and the power is produced by an increased gas flow during combustion. The "Brayton Cycle" (also known as Joule Cycle) of the turboreactors. which allow later the kinetic energy recovery at the same pressure that the chamber intake. because it does not use kinetic energy transformation. providing that some combustion comes in, to increase the flow at constant pressure like in turboreactor). through a cooling heat exchanger to act as a heat pump. In Brayton cycle, the pressure is the common denominator between the compressor and the power stroke (power turbine). the power flow in the hot Quasiturbine has to be much more important than the intake flow trough the compressor. but because it would impose a same flow at intake and exit, it would not produce net energy output. By using 2 QT, a small one as compressor, driven by a larger hot one at exit, would however makes it a net energy output engine. though a gearbox coupling, than the the hot power QT. and can be simply done by using different sizes Quasiturbine ! which also could in principle rely on 2 Quasiturbines of different sizes. and would constitute a complement to pulsed detonation of the future.